In the last week we had two decisions by the Supreme Court of the Zionist state which reveal how racist this regime is. The first one is the citizenship law which will affect thousands of Palestinian families on both sides of the Green Line and the second is the Bil’in court case. No one (including me) would have believed that Israel would take such a crazy step as this until the last few months. There is no country in the western world that has taken such a step, even the countries where terror attacks have occured on their civilians within their borders. Isreal is the only country that uses terror attacks as an excuse for legislating an apartheid law. There is no one in the world who can ethically say that if there is someone from a racial or religious minority who took a violent action against a country’s citizens that the entire community should be collectively punished. However, this was the reason that Isreali secret services used in court, and their game they love to play talking of the security of Isreal suceeded at convincing the judges. It is known, though, that the real issue they are concerned with is the demographic issue. The president of Supreme Court even noted that since 1993 there was just 16,000 applications submitted from Palestinians to unite families, suggesting that there is no large demographic danger. But no one mentions the reality behind this law, which is that the Israeli state is a Jewish state. There is no place for anyone who is not Jewish! This is the only democracy in the Middle East who builds their constitution on racist principles . However the Israeli Supreme Court wasn’t going to approve a law such as this, despite the support from the international mainstream community and their disgraceful silence, which made Israel feel supported even in such a racist step as this. The silence that the international community continues, especially after 58 years of occupation to the historical Palestine, encourages Israel to continue to refuse to take responsibility for the refugees and the massacres that happened at that time. They have fallen silent in forcing Israel to recognize the UN security council resolutions 194, 242 and 338. They have been turning away as Israel declared the “unification” of Jerusalem as a capital for Israel, formally annexing it, even though East Jerusalem is an occupied territory according to international law. To consolidate their occupation, Israel continues building settlements in the West Bank and finally the Wall, or what is so-called the “security fence”, with full Western support. All of these facts on the ground makes me not really surprised to see the Supreme Court in Israel approving one more racist law which is just one piece in a series of acts that aims to “evacuate” or “transfer” the local and the legal owners of the land from their lands by making their life and existence impossible. An Israeli friend stated accurately, “We are living in the 21st century and we can’t do the same things that we did in the past to continue the transfer. There are more inelegant ways for that by making life impossible for people so they leave without terrifying them in the way the Haganah and other Jewish milita groups did during the so called ‘war of independence’ “. After I talked about the citizenship law and its consequences it’s obvious that Israel will continue the big story of security . 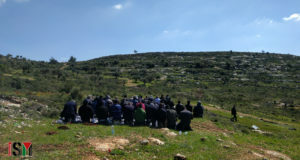 Last Sunday May 14th , the Supreme Court in Jerusalem was discussing one more important issue – the wall case in Bil’in, a small village west of Ramallah in the West Bank. Fortunately there is no final decision yet, even after a discussion which continued untill 9:00 pm local time. From the discussion there was an important thing that was mentioned, which again amounted to more racism and discrimination under the name of security. The thing the judge said was that the reason for building the wall was to protect the Jewish citizens from terrorist attacks with no regards to if the wall is built on the green line or not and with no regard to the legal rights of the owners of the land. However, the wall in Bil’in like in many places is built to protect settlers, who according to international law have no right to be there since they “settle” in a land that is stolen by force from its legal owners. Building the wall to protect Jewish citizens conceals a dangerous fact: Israel has started with its own unilateral plan. Its an introduction to building the wall around the main settlement blocks such as Ma’ale Adumim, Gush Azion, Alfe Menashe and Ariel. 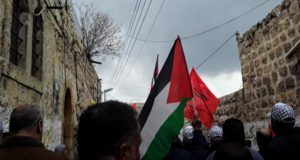 The plan calls for the settlement blocks to be annexed to Israel under the name of “security” and “protection”, again with no regards to their legal status. This will set a horrible precedent allowing for the building of the wall in any place in the West Bank for the same reasons. It’s obvious to all that this is one more way to force the people to leave their homes. I don’t know how far they can go using these justifications, but I would like to point out that from the Palestinian side, I don’t think the Palestinians want any more hassles in their life. We know the meaning of being a refugee – living in another country as a foreigner. The people have decided that they aren’t going to leave Palestine again. 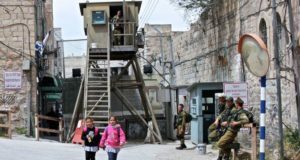 On the other hand, the international community should wake up and take their responsibilities to guarantee human rights and the application of international law, and sanction Israel for making more racist laws that transfer Palestinians from their homes.